I have improved my review format for the writing sample to make it more informative. I am now including a rating system for four key areas; the ratings are from one to five (five being the best). Please let me know what you think. I love red/orange brown inks and Diamine Ancient Copper is my new favorite. My two other (now former) favorites in this category are Montblanc Red Chalk and Noodler’s Antietam. Unlike Noodler’s Antietam, there are no issues with feathering and long dry times (on the papers I have tested) and unlike Montblanc Red Chalk, the flow is generous. Ancient Copper shows excellent shading; it doesn’t get much better. Dry time on this ink is on the faster side and it is not waterproof. 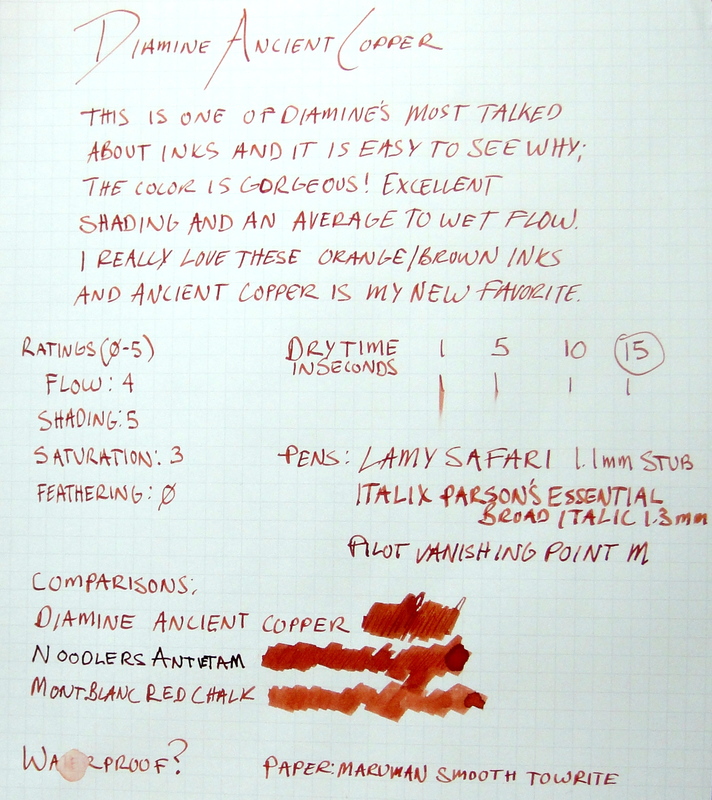 This ink changes quite a bit with different nib sizes; if you look at the writing sample you will see that with the Italix (1.3mm nib) the color is lighter and more orange, then compare to the Pilot (M nib) it looks darker and more red. Overall, Ancient Copper is a beautiful, well behaved ink. I highly recommend it. Please note: this product was provided to me at no charge by JetPens for review purposes.